AUGUSTA, Ga. – It’s going to be Breakfast at Augusta. The golf is probably going to be wild. Oh, and Tiger Woods is right in the middle of it all. In an effort to avoid dangerous weather that is supposed to sweep through Georgia on Sunday afternoon, the Masters altered its traditional final-round format. Competition will now begin at 7:30 a.m. ET and feature threesomes rather than pairings (the first time that’s ever happened in a final round here). Groups will start from both the first and tenth tee (those in contention will go from one and finish on 18, per usual). The leaders are expected to tee off at 9:20 a.m. CBS’s broadcast will begin at 9. That final grouping will include Tiger, who shot a 67 on a hot, muggy Saturday afternoon to come in at 11-under. He’ll join leader Francesco Molinari (13-under) and Tony Finau, who stroked a 64, one short of the course record, to also finish at 11-under. "We've got to get up early and get after it," Tiger said. Tiger has won 14 major championships, including four Masters. He’s never won any of them when he wasn’t in the final group on Sunday. In this case, that’s a weather-related bonus (if it was a pairing, he’d have been the second-to-last group due to when he finished on Saturday), not that it really matters. The entire scene on Sunday should be incredible, a complete free-for-all with a star-studded leaderboard. Saturday was a brilliant day of golf, with 10 different players, including Tiger, holding at least a share of the lead at some point. Finau was one of just three 64s, and that group includes Webb Simpson, who pushed his way to 9-under and in contention. Tiger grinded his round out, six birdies and just one bogey as he played mostly error-free golf to the delight of his typical monster gallery. At this point, Tiger is something akin to a traveling circus, waves and waves of fans spreading out across multiple holes in an effort to watch him play and cheer him on. This isn’t just polite golf cheers, this is loud and bold, thousands pleading and pushing him on to something that no one was certain would ever be possible again. At age 43, Tiger’s career has been derailed multiple times with injuries, personal foibles, legal issues and so on. He didn’t even play in three of the last five Masters and famously hasn’t won a major since 2008. As he strolled up 18 Saturday, the moment was lost on no one – not the roaring fans and not even Tiger himself. He seemed to bask in the cheers rolling down the hill and into the fairway as he smiled widely and repeatedly acknowledged the crowd. A fifth green jacket is the goal, but this was special too – the icon, back doing iconic things. "It's been a while since I've been in contention here," Tiger said. "But then again, the last two majors count for something. I've been in the mix ... so that helps." To make Sunday truly magical, planting his name alongside Jack Nicklaus here in 1986 for late-career improbable Masters glory, Woods is going to have to earn it. He’s never won a major when he didn’t lead after 54 holes and Molinari was showing no signs of fading. Meanwhile, a dream pack of contenders is right there ready to charge. Five of the top seven on the leaderboard have won majors (Molinari, Woods, Brooks Koepka, Webb Simpson and Dustin Johnson). Finau, meanwhile, just carded a 64, and Ian Poulter is considered one of the best players in the world to not have a major. All eyes will be on Woods, though. How can they not be? His game was unexpectedly resurrected last summer when he contended for both the British Open and PGA Championship. 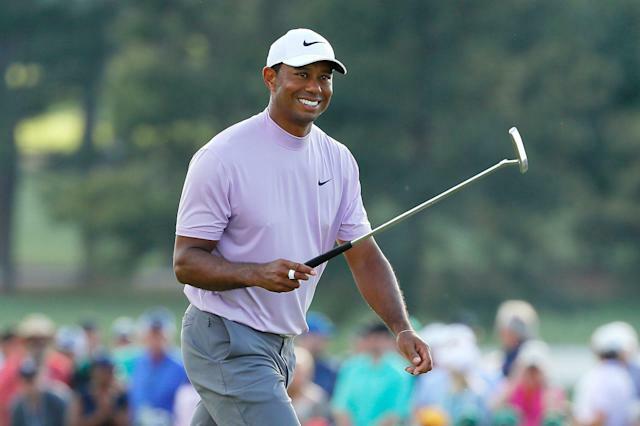 The Masters has always been his playground, though, and even fellow golfers are excited with the prospect of Tiger, wearing his signature red, back at Augusta National with a chance to win. That’s going to happen. Earlier than normal, with an unusual setup played against the pending rain and storms. The weather is supposed to get Biblical on Sunday afternoon around here, so Sunday morning service at Augusta is set. Tiger Woods is in contention at the Masters. For real. Set your wake-up alarms accordingly.